To take advantage of role-based management, the Primary Administrator must create a role, define permissions, add administrators, and assign one or more administrators to the role. A role allows administrative privileges or permissions in Configuration Manager. Creating a role requires definition of permissions to list, view, create, edit, delete, and/or control a specified configuration object. For example, you can define a Campaign Manager role with permissions to create, manage, and supervise wallboards or campaign functionality. Go to Security > Roles to add or edit roles. By default, every tenant is bundled with a Super User role assigned to the tenant's Primary Administrator. A Super User role provides all permissions to configure tenant functionality. You can assign any number of administrators to the Super User role. Note: You can assign the role of an administrator when creating a new user. As soon as you choose a user to be an administrator, the option to select a specific role appears. You can continue to define the Roles and Administrators in Security tab. Note: By default, every tenant is bundled with a Super User role. A Super User has all permissions to configure tenant functionality. You can assign any number of administrators to the Super User role. Determine the permissions to be given to the role. 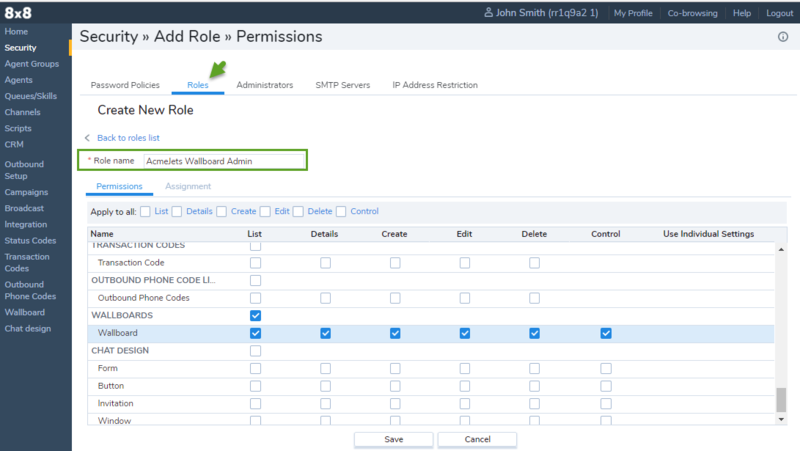 Select functionality objects such as Wallboards and check the appropriate permissions. List Lists all the entities pertaining to an object. For example, List permission in the Agents tab allows an administrator to list all existing agents in the tenant. Details Allows to view details of each entity. For example, with the permission to view details, you can view agent account details. Create Allows you to create a specific subset of a Menu Object functionality or an entire Menu Object. For example, you may create a role with permissions to create Inbound and Outbound queues, but not Email and Chat queues within the Queues Menu Object. Edit Allows you to edit a specific subset of a Menu Object functionality or an entire Menu Object. Delete Allows you to delete a specific subset of a Menu Object functionality or an entire Menu Object. Click Save to add the new role. The next step is to assign an administrator. An administrator inherits permissions assigned to a role and can assume a single role at a time. You cannot assign multiple roles to an administrator, but multiple administrators may function in a single role. Go to the Administrators tab. First Name Enter the first name of the Administrator. Last Name Enter the last name of the Administrator. Email Address Enter an Email ID to communicate with the Administrator. Role Select a role from the list of defined roles. User Name Enter a username used to log in to the administrator role. Note: Password should match the password policy requirements. Retype Password Confirm the password. Language Enter a language of choice for the Administrator user interface. Enabled Select the check box to activate the Administrator. Click Save to create an administrator. After creating a role, you can assign an administrator to the role. The administrator inherits all permissions assigned to the role. By logging in to Configuration Manager, the Secondary Administrator gets access to the functionality permitted for the role. You can also reassign an administrator to a new role. From the list of administrators, select and assign an administrator to the role. Click here to learn how to create administrators. After assigning an administrator to a role, you can log in and validate that the Secondary Administrator account has the intended permissions. For details, refer to Log In. A Secondary Administrator can change password and set up a security question by clicking Profile on the top bar of the Virtual Contact Center application. Click My Profile at the top of the screen. Enter a new password or security question.